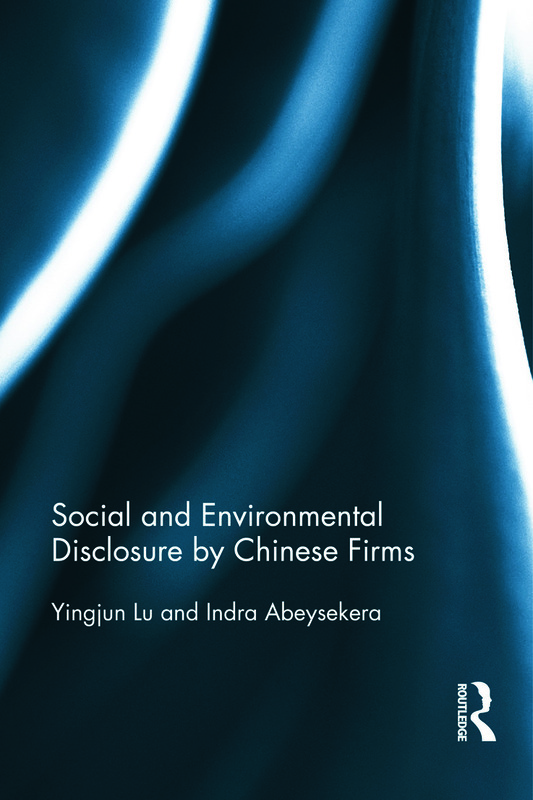 Given the increased social and environmental problems in China, this book looks into the social and environmenta disclosure practices of socially responsible Chinese listed firms by constructing a stakeholder-driven, three-dimensional, disclosure index. The book contains a three-part study: the first part explores the current status of social and environment disclosure practices. The second part empirically examines the relationship between corporate social and environmental disclosure and various influencing factors (i.e. stakeholders’ power and corporate characteristics). The third part empirically examines the link between corporate social responsibility (CSR) reporting (i.e. publishing a CSR report and the quality of the CSR report) and socially responsible reputation. The book finds that the CSR report provided more stakeholder-relevant social and environmental disclosure than the annual report. It also finds that corporate characteristics such as firm size, profitability and industry classification are all statistically significant factors influencing the social and environmental disclosure of the Chinese firms studied. Shareholders significantly influenced firms’ social and environmental disclosure, and creditors significantly influenced firms’ disclosure related to their environmental performance. The final part of the study reports that publishing a CSR report and CSR reporting quality had a positive influence on firms’ socially responsible reputations and that the CEO/chairman duality negatively influenced firms’ socially responsible reputation. This book will be of interest to those who are keen to learn more about corporate social responsibilities in the context of Chinese firms. Yingjun Lu obtained her PhD from the University of Wollongong, Australia. She is Lecturer in Accounting at the Shanghai University of International Business and Economics, China. Her teaching interests include both financial and managerial accounting. As an accounting academic, she has expertise and research interests in social and environmental accounting and corporate governance. She has published on social and environmental disclosure, internal audit and corporate governance in Chinese and international journals. Indra Abeysekera is a skilled and committed accounting academic and research leader, having expertise in financial accounting. Professor Abeysekera has an outstanding track record in the accounting discipline, four peer reviewed research books, and publications in excess of 100 articles. He is currently Associate Professor in accounting at the University of Wollongong, Australia.